The National Gallery of Victoria - Two Decades of Australian Fashion Designs by Linda Jackson. The National Gallery of Victoria exhibition, 'Linda Jackson: Bush Couture' was drawn from the gallery's Fashion and Textiles collection and from Linda's own archives. This retrospective exhibition, held at the Gallery's Ian Potter Centre in Federation Square, Melbourne, ran from 26 January 2012 until 9 September 2012 so, for a glimpse into the history of textiles and the way in which Linda and Bush Couture helped to imprint an Australian identity in the culture and couture of the nation, I hope that you managed to see it! Curated by Laura Jocic, the exhibition explored the first two decades of Linda Jackson's career, when she was travelling, learning, exploring and establishing herself as a leader in Australian creative fashion design. 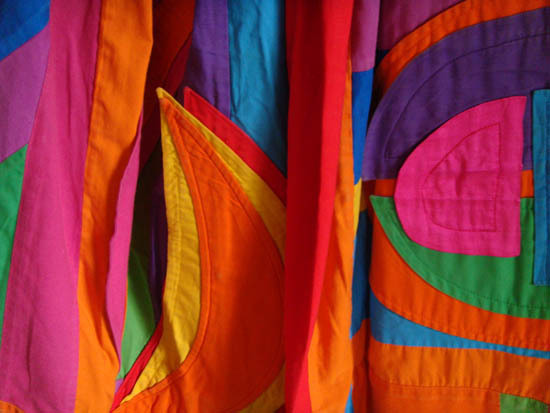 Detail Rainbow Patchwork outfit 1975: Linda Jackson, 'Bush Couture', National Gallery of Victoria. Photo Linda Jackson. 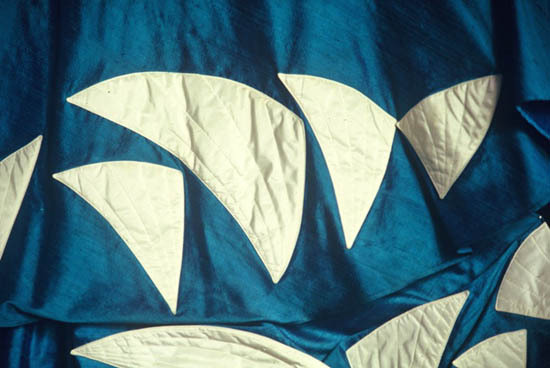 Linda's interest in traditional cultures and her passion for the Australian bush inspired her uninhibited use of strong colour, of sharp lines and bold patterns, so that her original designs forged a new national cultural and fashion identity that was unmistakably Australian. She was a pioneer of the Australian fashion industry; without her it most certainly would not have been such fun! The 1960s were an exciting time of discovery for Linda. After studying fashion design and photography in Melbourne she set off with friends to travel and explore the world - a year in the wilds of Papua New Guinea was followed by time spent living in and learning about the cultures of Singapore, Indonesia, Bali, Istanbul, Amsterdam, Paris and London. Back in Australia in 1973 she established a dynamic partnership with kindred spirit, Jenny Kee and the new 'Passion for Fashion' Oz style was born - Jenny Kee opening her Flamingo Park frock salon and Linda with her studio at Bondi, then Kings Cross. As well as seeking inspiration from the colours and light of the Australian landscape, its deserts, bush, minerals, flowers and animals, the duo included aboriginal culture and arts as a vital component of the expression of that Australian identity. Detail 'Sydney Opera House' 1977; Linda Jackson, Bush Couture, National Gallery of Victoria. Photo Linda Jackson. With a spontaneity born of youthful energy, skill and enthusiasm, the pair set off on the adventure of transposing the drama and essence of the landscape to their fabulous artistic creations. A highlight of this ten year period was the annual Flamingo Follies parades, held at a different Sydney location each year. 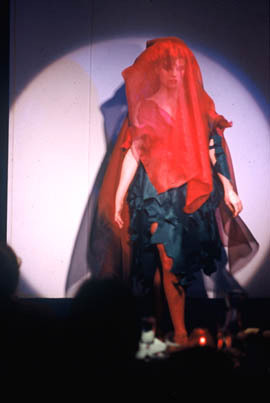 Linda remembers - "The Sydney Opera house frock opened the first fashion extravaganza and set the scene for the creative events to follow - collaborations with the most talented artists, photographers, models, musicians and more! ...Colour - Chaos - Creative - Cosmic - and all Consuming! ...Tramping in the bush, camera in hand with Jenny draped and wrapped in prints...taffeta bark frocks ...art knits...waratah taffeta...or black cockatoo petals..."
The early collections used selections of fabulous vintage 1940s and '50s printed cottons and rayons. 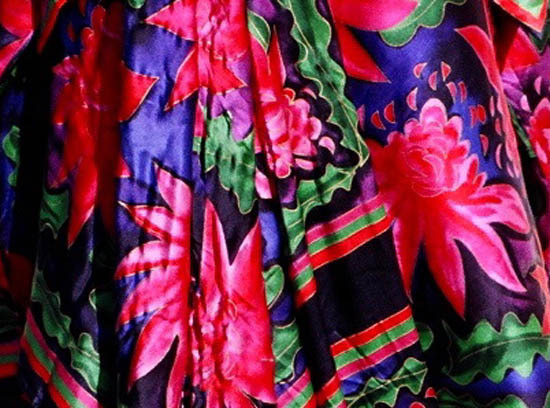 These prints were to inform the future hand-painted cloths and couture. 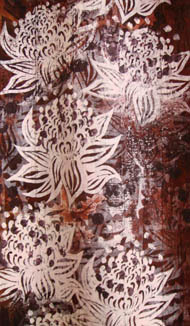 'Waratah' 1990, 'Bush Couture', National Gallery of Victoria. Photo Linda Jackson. 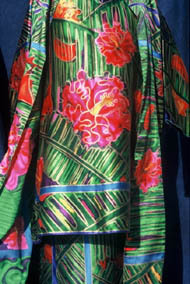 Influenced by artists and couturiers such as Christian Dior, Madeleine Vionnet, Sonia Delauney and Henri Matisse, Linda developed her original paintings and fashion design sketches to create wearable art that featured colorful abstract designs or appliquéd Australian wildflowers and gumleaves, even the Sydney Opera House! 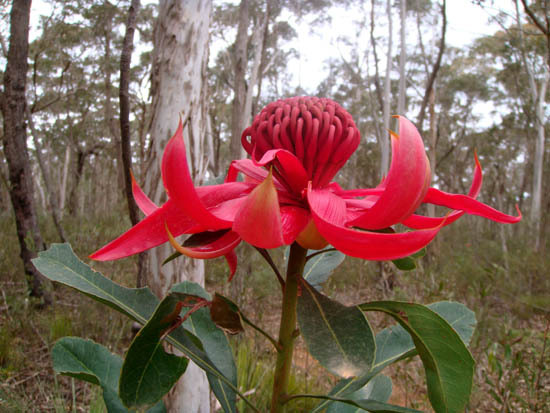 Always there was an undercurrent that referenced the fabulous red waratah flower from the bush around Sydney and incredible Lightning Ridge opals. 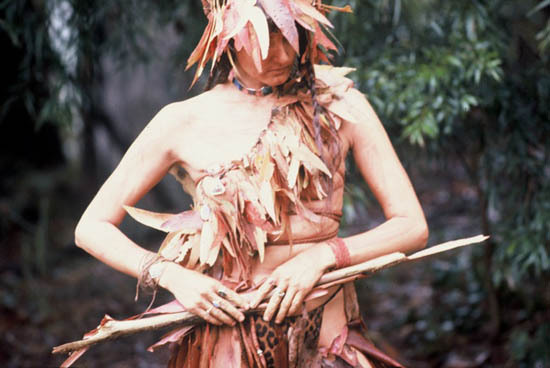 Linda's environmental photographic art in the landscape, where she photographed outfits in the landscape that inspired them, was an extension of her art and remarked upon in the publication by the National Gallery of Victoria in its 'Linda Jackson, Bush Couture' catalogue. Linda saw this 'Keeping Australia Beautiful' project as "...conjuring up dreams and fashion fantasies with no limits to experimenting and challenging oneself to turn these visions into reality..."
'Waratah Portrait' - Photo Linda Jackson. 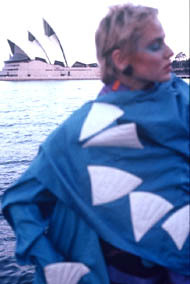 1977 brought recognition when Linda and Jenny won the Innovators category at the Fashion Industry of Australia's Lyre Bird Awards for ‘creative and original designers who are establishing a distinctive Australian fashion image’ and then toured their collection to Milan, Paris and New York. Linda has always enjoyed working collaboratively with other artists and this, in my opinion, is one of her strengths, which continues today. 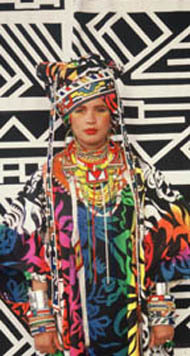 In the early days, creative partnerships were established with Jenny Kee, with Fran Moore, Peter Tully, David McDiarmid, Bruce Goold, Deborah Leser and various aboriginal communities such as those in Central Australia, Northern Australia, the Tiwi Islands and, more recently, Tropical North Queensland. Linda Jackson archive, 'Bush Spirit' 1983 - 'Bush Couture' National Gallery of Victoria. In 1980 Linda travelled to Central Australia and to Lightning Ridge, the first of many trips to remote outback areas and communities. Her response to the vastness and the red earth became evident as she developed artworks that evolved into paintings and fabric prints, some becoming flowing garments, all recounting images and visions - stories which told of the far stretching Australian deserts. Here occasional watercourses run briefly through steep palm-fringed rock gorges where flocks of sulphur-crested cockatoos and pink-and-grey galahs frolic and squawk. After rain the desert blooms with carpets of wildflowers, especially the brilliant red and black Sturt’s desert pea, blue-grey saltbush and the waving heads of spikey spinifex. This emphasis on designs inspired by the inland areas of the continent led to the establishment of the remarkable concept of 'Bush Couture'. Vibrant colour and patterns in the Australian landscape are a continual source of inspiration for Linda and play a significant role in the development of her artworks...black opals from Lightning Ridge, boulder opal from Western Queensland, lyrebirds, cockatoos and galahs, red rocks, ancient river beds with tired gum trees waiting for rain..all are fascinating subjects for her creative and enquiring mind. 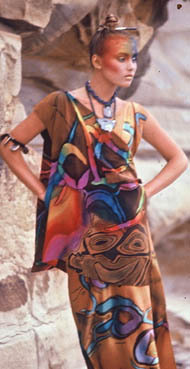 After establishing Bush Couture more travel, especially to New Zealand and Africa, followed for Linda, resulting in paua shell designs and ‘Massai Africa’ which captured her heart and reflected the vibrant colours and loose clothing of African women, along with natural beading and jewellery adornments. 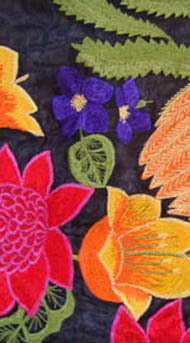 These gorgeous pure silk scarves are available from the National Gallery of Victoria shop or from Linda direct. Classes and workshops were held by Linda and the Gallery staff during the year at the Ian Potter Centre at the National Gallery of Victoria.